A host of new micro-investing apps including Robinhood, Acorns, and Stash, make it easier than ever to invest on the go — with zero experience and little more than pocket-change to pony-up. Is that a good thing in a fluctuating market? It all depends — on who you ask, what you’re after — and even how addicted you are to your smartphone. 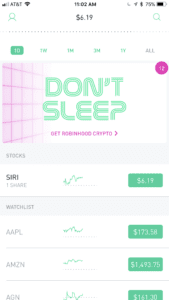 I decided to try out a few of these apps after my 26-year old stepson sent me an automated text from stock brokerage app, Robinhood, which lets you buy and sell individual stocks for $0 a trade. ‘Sign up now, and get a free stock,’ the text read. So, I did. I downloaded the app on my iPhone, and followed the prompts to fill-in a bunch of information: Home address, social security number, and link to a bank account. That was actually my first hurdle. Putting so much sensitive information into an app on my smartphone creeps me out. Most of us have been through how many data breaches by now? A quick check of Robinhood’s policies explains that it uses “bank-level security measures to protect [my] personal information,” including encrypting my “password, social security number, trades, and other sensitive data.” So, I swallow my trepidation and move ahead. Once I finish getting it all set up, which takes less than five minutes total, I let the app pick a stock for me at random. As of right this moment, I own one share of SIRI (Sirius XM) worth $6.32. Okay, I think, now what? I repeat this process with two more of these kinds of apps. Acorns lets you round up credit and debit card purchases to the nearest dollar and then invests your digital change. It’s easy to “set and forget,” free for college students for four years with a valid .edu email address. Or you pay $1 a month until your account balance hits $5,000, then 0.25% of your account balance per year. The first month of account management is free. After that, you pay $1 a month in management fees for accounts under $5,000 and 0.25% on higher balances. 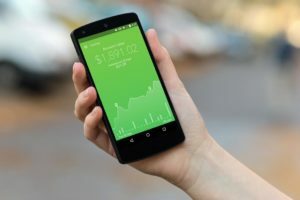 According to personal finance site NerdWallet.com, the biggest upside to micro-investing apps is that they let you bypass brokerage account minimums and skip the struggle of saving up enough to invest in a mutual fund. Download the app, set up a profile that lets the company know the best kinds of things to invest your money in, connect a bank account — and you’re off. ARE MICRO-INVESTING APPS GOOD IN A FLUCTUATING MARKET? My stepson and several of his friends — all who fall into that Millennial-aged sweet-spot target market for these apps — say they’ve been great. What once was prohibitively expensive and especially daunting for this demographic — is now literally in the palm of their hands. As one Bloomberg article puts it, “Tap a stock, choose the number of shares, then swipe, Tinder-style, to buy.” What’s not to love? Many of the app users I spoke with told me they’re adding about $25 a week into their micro-investing accounts. Not enough to really “make or break” them financially should the markets take a massive downturn. The apps give them a cheap, convenient, and familiar modern way to dabble in investing by making small, automated transfers into passive, individual non-retirement accounts. “I use them to learn about the stock market and gain perspective in general,” my stepson, Guy Blelloch, tells me over the phone. His Robinhood account grew by about $500 in the first year — or about 15% — on his initial investment. That’s about 14.99% more than it would have earned sitting in a traditional saving account during the same time period, he points out. Of course, he could have just as easily lost it all too. on admit, they were worried. “I bought BofA stock and freaked-out when it plummeted. But just being patient, not panicking, and watching it climb back up was a great way to learn,” he said. 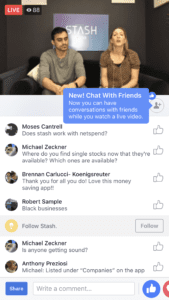 On several Facebook group pages, micro-investing app users encouraged each other to “ride the wave,” and invest for the long term. Acorns and Stash also sent in-app messages, reiterating the importance of riding out the rough patches. Personal finance experts far and wide agree that novice DIY investors need to do their homework: Are you taking advantage of an employer-matched 401(k), have you done the math on those seemingly small fees, and do you have access to tax-favored investment accounts like a traditional or Roth IRA, with more investment choices and lower management fees? These are all questions Andrea Coombes, NerdWallet’s Investing and Retirement Specialist asks when I call her. The final warning comes from both people using micro-investing apps, and the financial experts watching from afar: Be careful not to get too obsessed. Several users told me that instead of obsessively checking their social media feeds — they’re now obsessively checking their stocks. These kinds of apps are exploding right now. As of last count, Stash has 1.8 million customers and 5 million educational subscribers, with approximately 40,000 new clients joining weekly. Acorns is now up to 3 million users. Robinhood also says they have about 3 million accounts, and more than 1 million people signed up for early access to Robinhood’s new crypto trading service. While I’ll sit for at least a year on the investments I’ve now made into Robinhood, Acorns, and Stash, they’re not not the kind of thing I’ll be using for much more than saving some spare change at the end of the day — kind of like the more modern-day version of my old spare change jar. Then again, I’m not the target demographic. My stepson and his friends are. For them, the key seems to be using these apps more as learning tools than get-rich-quick schemes. NOTE: An edited version of this story ran in the print version and online at USA Today.